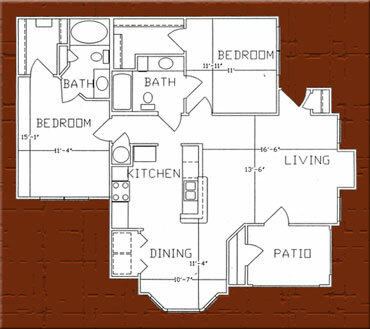 Below you will find information and layouts of our four different floorplans available at The Hamiltion. Just click on any link below to see the details . 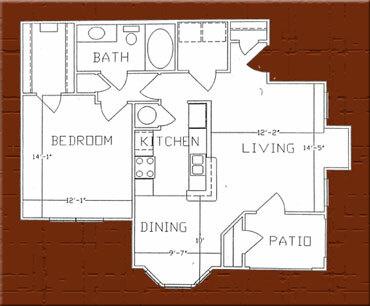 You’ll enjoy light and airy floorplans that were truly designed for comfort and modern living. Questions? Please give us a call. Our professional staff at The Hamilton are happy to help. With modern design elements and a practical layout, this 1BR-1BA floor plan offers a superb use of space that makes this cozy apartment home feel much larger than you’d expect. As you walk through the front door, you’ll notice the generous living room space, custom-built bookshelves, and French doors leading to your private patio or balcony. A well-appointed kitchen with a breakfast bar opens into the dining area and living room. The hallway leads to your bedroom, an abundant walk- in closet, and full bathroom with linen cabinet. The utility closet provides full-size washer and dryer connections. Stylish and efficient! 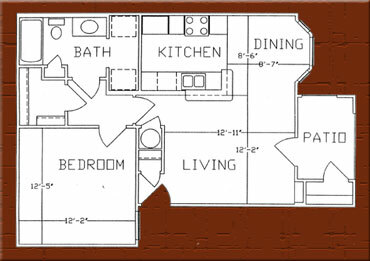 With over 800 square feet of living space, this roomy 1BR-1BA floor plan provides the extra space you need to stretch out and relax. You’ll be impressed by the spacious living room that includes a cable-ready entertainment alcove – perfect for your home electronics requirement. The open kitchen is equipped with all major appliances including microwave, dishwasher, refrigerator with icemaker, and electric range/oven. Behind the privacy door is your master bedroom suite – complete with a deep walk-in closet and a full-size bathroom with garden tub. This apartment home also features a private patio or balcony, and a generous utility room with full size washer and dryer connections. Welcome Home! This open and inviting 2BR-2BA apartment home is perfect for roommates, a small family, or an individual wanting a separate home-office or multi-purpose room. You’ll appreciate the abundant natural light that pours through the numerous windows in the living and dining areas. The modern kitchen is fully equipped with all major appliances, and features generous counter top and cabinet space too. Your master bedroom suite includes a walk-in closet, a spacious full bathroom with garden tub, and access to the private patio or balcony. The guest suite includes a wall-to-wall closet with sliding-doors and a separate, extra storage closet as well. The second full bathroom is conveniently accessed from the guest bedroom or the hallway. This apartment home also offers a built-in hallway shelf and a generous utility room with full size washer and dryer connections. Perfect privacy and fabulous function! Measuring nearly 1,100 square feet, this spacious and stylish 2BR-2BA apartment home is sure to accommodate all your furnishings. 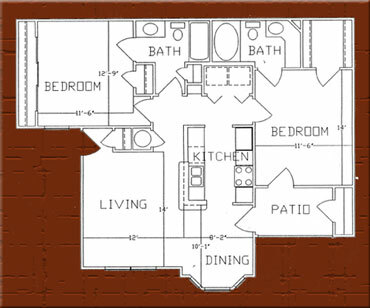 You’ll enjoy a light and airy floor plan that was truly designed for comfort and modern living. The open living room includes a large, cable-ready entertainment alcove – perfect for your home electronics requirements. The designer kitchen is equipped with all major appliances including microwave, dishwasher, refrigerator with icemaker, and electric range/oven. Your master bedroom suite includes a huge walk-in closet, a private full bath with garden tub, and linen cabinet. The guest bedroom suite includes its own deep walk-in closet and a second full bathroom which is conveniently accessed from the bedroom or the hallway. This apartment home also features a private patio or balcony with French doors and utility room with full size washer and dryer connections. Unmatched space and value!